How do I set up the Google Sheets Add-on? Build pivot tables, create charts and build custom tables in Google Sheets and let AdStage provide the data! 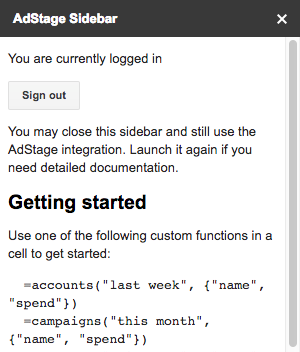 Follow these instructions to get started with AdStage's Google Sheet Add On. 1. To add the Google Sheets AdStage Add-on follow this link. Click +Free in the upper right hand corner. 3. Go to any sheet in Google Sheets. Click Add-ons in the toolbar. From there hover over AdStage and click Launch Sidebar. 4. Sign in to continue. 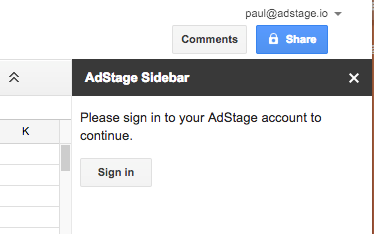 If you don't have an AdStage account you can start your free trial here. 5. Once signed in. You'll see documentation in the sidebar. The documentation (and more) is also listed in this article. If you're a Google Sheets wizard, then the documentation should provide enough info to start building powerful reports in Sheets. We've also created a few templates for you to check out if you prefer to get a head start. 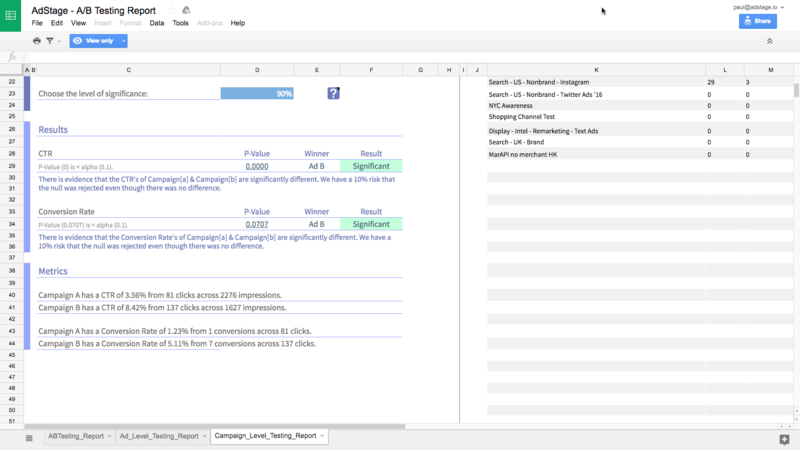 Simply open the template, make your own copy, and start building reports. Not sure what column/metric names to use? Check out our full list of metric and metadata names. We try to keep things pretty flexible. For example, you don't have to say 'link_clicks', the add on will understand 'Link Clicks' just fine. Looking to report on Facebook Direct data? You can use the Facebook Direct endpoint. More info on setting up direct calls here. 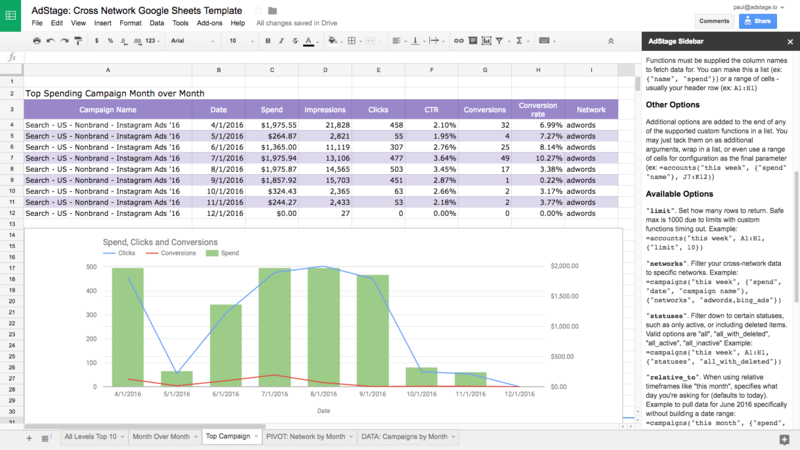 Looking to report on AdWords Direct data? You can use the AdWords Direct endpoint. More info on setting up AdWords Direct calls here.